Improv is just comedy, right? What could it have to do with success or productivity in the workplace? Andrew McMasters, co-founder of Seattle’s Jet City Improv, plays a couple of improv games with Jim & Steve to explore how improv training turbocharges teamwork … Plus, the four reasons relationship fail. 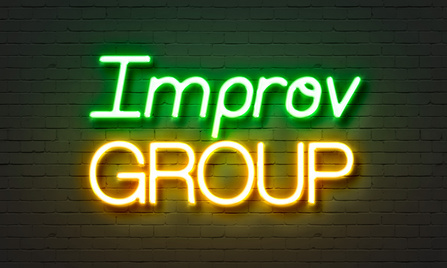 Steve Motenko: Today on the The Boss Show, how improv games make teams work better. We will have joining in studio with us Andrew McMasters, founder of Jet City Improv. Welcome to the show, I’m Steve Motenko, I’m The Psychology Guy, I’m a leadership coach and a personal development coach right here in the Seattle area. Jim Hessler: And also a darn nice guy. Steve Motenko: -with that sometimes. Jim Hessler: You’ve hidden your inner anger well with me. I appreciate that. I’m Jim Hessler, I’m The Business Guy, I’m the founder of Path-Forward Leadership, and the co-author along with Steve of the book Land On Your Feet, Not On Your Face. Jim Hessler: So it’s a how-to article then. Steve Motenko: Exactly, for those of us who are looking to make our relationships fail. So the four reasons, and I’m just going to toss them at you one at a time and I want them to bounce off you, criticism – so not constructive criticism, but the destructive kind, so negative generalizations, character labels, that sort of thing. Jim Hessler: Yeah, just feeling like the other person is lessening you as a human being. They’re diminishing your value as a human being. That’s difficult. I don’t care how big your ego is or how grown up you are, you don’t like to be treated that way. Steve Motenko: Right, and if you don’t like to be treated that way, then when you are treated that way, you will shut down. Jim Hessler: Well and you tend to start thinking less of yourself in the process. Jim Hessler: Yeah, there’s that. Steve Motenko: That doesn’t work in relationships? Jim Hessler: Yeah, I’m with you on that. [crosstalk 00:02:30] I can’t remember a good relationship I’ve had where there was contempt present. Steve Motenko: Infused throughout it, yes. Of course, we’re talking the workplace here, so, do you know people who are critical. Again, we’re not talking about healthy, constructive feedback. We’re talking about this real kind of saturated-with-negativity sort of criticism. Jim Hessler: Looking for the worst in other people instead of the best. Jim Hessler: Wanting to be a victim, you know. Jim Hessler: To make them your persecutor and the reason why you’re not successful, you know? Steve Motenko: Right. So hopefully, your boss isn’t that way. Hopefully you’re not that way. Hopefully you don’t know people in the workplace who embody criticism and contempt. The third reason that relationships fail according to this emotional intelligence writer is defensiveness, which includes responding to criticism with criticism. Steve Motenko: Includes making excuses and rationalizations for your behavior. It includes, of course, blaming others when things go wrong. Jim Hessler: You know, it’s interesting how often the second voice in a dialogue is just as important as the first voice, so if somebody comes at you with a criticism, you can just be victimized by that and the relationship conversation dies. Steve Motenko: Lash back at them. Jim Hessler: Or there’s a good mature way to come back to that, you know, so when you’re getting feedback of any sort, the receiving of the feedback is just as important as how it’s given. Jim Hessler: How do you respond? Steve Motenko: You can respond in a healthier way, you can at least take your responsibility for turning that conversation around. And then the last one is stonewalling. Which, by which he defines essentially, the silent treatment. [crosstalk 00:04:19] So just not saying anything, you know, crawling into your shell and just playing victim, silent victim. Jim Hessler: Of all of them, that’s probably the hardest for me to deal with. It’s the one that gets my dander up more than anything else. Steve Motenko: Isn’t it? All I want to say for now is all these four reasons relationships fail, all of them are precluded by the improv process. Andrew McMasters is an actor, director and co-founder of Seattle’s Jet City Improv. Andrew uses the principles, Jet City Improv, I guess, uses the principles of improv to get teams in the workplace to understand how they communicate, and how they could communicate better. Andrew joins us in the studio, welcome to The Boss Show, Andrew. Andrew McMasters: Thank you, thank you very much for having me here. Steve Motenko: Thank you so much for taking the time. One thing when we had our little pre-call. One thing that stuck out for me is you said that the main rule that we teach in improv, and I think all of you will understand how this applies to the workplace is, it’s not about me. Andrew McMasters: Yeah, it’s one of the main rules that we teach, which is really about the external focus. The rule that we teach our actors all the time is about if I am making my team members look good, then I’m doing my job. So it’s really about helping everyone else that’s around you, and then not really having to worry about yourself. So it’s not about the spotlight being on you. That even goes so far as to say that if you said something, and the audience laughed, it really isn’t about you, it’s actually about the fact that your team set you up for you to be able to say that, so that’s why that happened. Steve Motenko: So it’s really an experience in kind of letting go of your ego. Andrew McMasters: In a lot of ways. Jim Hessler: And I’ve done some improv work and that’s the hardest part. For me that was the most difficult part, because Steve knows it’s always about me anyway, right. [crosstalk 00:06:10] I’m saying it before you get a chance. Andrew McMasters: I think it’s always about all of us, so that’s okay. Jim Hessler: Well thank you. You’re much nicer than my partner here. But, yeah, because you know, you want to be glib, you want to be witty, you want to be funny. You want to say that line that disarms everybody and everybody’s laughing and thinks you’re just all just entertaining as all get out. You just have to put that aside. You have to listen more than anything else. Andrew McMasters: Intently listen, and that’s one of the other skills too is really, how do you listen and what ways do you listen in order to be able to call back the things that are happening. So it really is about listening with not just your ears but your entire body. Steve Motenko: As a comedian, I mean, we think of improv as comedy of course, and most comedians we think of as having big egos in the sense that they need people to laugh at them, they need to be funny in the eyes of other people, and so even though this is comedy, it kind of a whole different, it’s almost the opposite view of the situation. Andrew McMasters: In a lot of ways, because that idea of the individual, like, I could say a joke, and someone would laugh. That’s great, that’s fine, however, when something comes out of real honesty, then an audience responds with laughter in that way and that laughter actually lasts longer and it’s deeper and it means something. So what we try and teach actors all the time is it’s really about just the honest response. The honest response is always going to be the funniest response. Steve Motenko: So one of my questions for the interview is why is experience in improv beneficial for workplace teams? You’ve just hit on two of the huge ones, listening, letting go of ego, actually three, and being, having your experience be all about what benefits the team. Andrew McMasters: Yeah. Even when you were mentioning in the first segment here about the four reasons that kind of kill relationships, I’m listening to all of that saying, oh, this is yes, and will really help with this idea, the ability to hear what someone is saying, and then accept on that offer and then build on it. It really is kind of one of those things that will let go of the ego. I might want something to go one direction, but someone gave me an offer. I need to accept it, and I need to build on it. Steve Motenko: So, in your marketing message, when you’re going to companies and saying, I could help your teams communicate better or enhance effectiveness, what do you tell them other than what we’ve already mentioned about how improv is beneficial and we have about thirty seconds. Andrew McMasters: The main thing I tell them is that it’s one thing for me to read it or discuss it, but it’s another thing for you to get on your feet and try it. This is going to be experiential work. You’re actually going to get on your feet and your body is going to have an experience of doing it and then hopefully you can tie that together with the intellectual idea and make real change. Steve Motenko: So how much resistance do you get to that? Andrew McMasters: All the time. Because that’s the scariest part, but understanding too that if I’m really externally focusing, I don’t have to be that scared. Steve Motenko: And, of course Andrew, you said that we can’t really understand it until we experience it. Jim Hessler: Don’t say we. You have asked him. I did no such thing. I’m getting caught completely surprised by surprise right now. Andrew McMasters: Good, good, good. Steve Motenko: At this improve process, because you can study for it, right? All right, go for it. Andrew McMasters: Oh, okay. Actually I just want to run you through the idea of what “Yes, and” is. So it’s really about, once I hear that offer, I can accept the offer and then I build on the offer. So, really quickly, I’m just going to ask a question. So, Jim, this is going to be a yes or no question, and I want you to respond with no. Very simple. All right? Okay, can I have twenty dollars? Andrew McMasters: Great. Very easy, right? Andrew McMasters: Okay, good. Now let’s try another one. I’m going to ask you a yes or no question. This time, you do respond, and you say yes. Andrew McMasters: And then you say but, and then you follow it up however you want. Andrew McMasters: So we’re going to practice “Yes, but.” Okay? Will you give me twenty dollars? Jim Hessler: Yes, but I expect to be paid back with interest. Andrew McMasters: Right. Okay, so you see how it’s kind of like saying no. Jim Hessler: Yeah, right, exactly. Andrew McMasters: I like to call “Yes, but” the Seattle no. Andrew McMasters: Which means I don’t want you to hate me, so I’m going to say yes, but really the answer is no. So what we teach is “Yes, and.” It’s really about hearing and then accepting and then building. So let’s play, all three of us, an idea on “Yes, and.” What is a question that you want answered. A question about life, anything like that. Any questions, an idea? Jim Hessler: What is the essence of leadership? Andrew McMasters: At a time until we’re finished. Jim Hessler: This is going to sound really weird on the radio. Andrew McMasters: Yeah. Nicely done. Good. Great. So you get the idea. We have to listen to what the other person said. Steve Motenko: So, I’ve got to say, there’s fear in it for me. Andrew McMasters: Yeah, isn’t there? Jim Hessler: You were trying to say the perfect word. Andrew McMasters: As the next word on the line. Jim Hessler: The experience of this is listening. Jim Hessler: It’s really, it’s fine to think of the right word and the best word to say in that sentence, but you have to listen to what the people said ahead of you for the word to make any sense. Andrew McMasters: And letting go, because I might want to say pterodactyl. Andrew McMasters: I really do. But in order to actually fulfill the goal, I have to let go, and I have to be a part of the group. Andrew McMasters: When I said more, you kind of had no choice but to say and, right? Jim Hessler: Yeah, exactly, yeah, yeah. Andrew McMasters: And that’s important too, I think in a leadership context, and also in business. Sometimes you have to be the “the” person. Sometimes you have to be the “the” person. Steve Motenko: But you just move things along. Andrew McMasters: And without you, it doesn’t make sense. Jim Hessler: I like it. Jim Hessler: Yeah, a word that I use more in my business career than I ever thought I would is play. I find myself saying let’s play with that idea, let’s play with that comment, let’s play with that concept. How do children learn? Children learn how to be in the world by playing with each other. So does the animal world. We see cougars playing. They’re learning to hunt by playing, right? So play is underrated, it’s a great concept. Jim Hessler: They’re using a different part of the brain. Jim Hessler: The same reason you might remember the lyrics of a song you heard 30 years ago more than you remember something that somebody said without music attached to it. Steve Motenko: Yeah, so in the context of enjoyment, more learning happens, and of course, the team bonds better, and they learn to trust and respect and like each other more. So lead us into another game. Andrew McMasters: Okay, so this one is very much about a little bit of presentation training pieces that I do as well. It’s about, kind of staying on message and being nimble. So it’s really about being nimble and on your feet. What I want is, you’re just going to ask me any question at all. Question about anything at all, and I’m going to respond. During my answer, I’m going to insert these three words. Three-legged dog. Andrew McMasters: They can be in any order. Andrew McMasters: They can be anywhere, only whatever the question is, I have to insert it. So, we’ll try it, go ahead and ask me a question, then we’ll switch. Jim Hessler: So, how did you get to the studio today, Andrew? Andrew McMasters: Oh, really interesting. I had to take three different ways in order to get here, and in fact there was a traffic jam that was kind of, like getting in the way so I had to take this little dog-legged, to be able to get around to where I could park to get it in. Jim Hessler: Steve, you got a question for him? Steve Motenko: Why are you wearing a striped shirt. Andrew McMasters: I actually like the stripes because there were only three shirts that I had this morning that were still clean so I decided to wear the striped one. Also, I noticed the pants that I’m wearing, with the different colors that I have in my legged pants here, that I needed to wear this shirt, that it would fit well, and then also, my dog was laying on the rest of my clothes. Steve Motenko: Always a problem. Andrew McMasters: It really is about how do you sort of stay nimble. Andrew McMasters: You want to try one? Andrew McMasters: Okay, all right. Jim Hessler: So I’m doing three-legged dog too. Andrew McMasters: Yeah, why not, okay? So, what kind of car do you drive? Jim Hessler: Well, you know, I drive a Prius, it’s my third one so I’ve had three, and I need room in the back because I have animals, I have a dog. I also really like the fact that there’s a lot of leg room in the Prius. Andrew McMasters: Got it, yeah. Steve Motenko: Jim, you hate dogs. Jim Hessler: I really do actually, so I just lied. Sorry, sorry audience. I’m one of those people. Steve Motenko: As opposed to the truth that Andrew was telling, right? Andrew McMasters: Exactly. So the idea with this too is, what I will do with companies when we talk about this is then take your entire mission statement or the idea that you’re trying to say to someone, especially in a sales context, and let’s narrow it down to the three main ideas. Andrew McMasters: Now, no matter where the conversation goes, if someone said, if you were a tree, what kind of tree would you be? You can now respond and make sure you can stay on message and bring it back to where you want to be. Steve Motenko: That’s teaching people how to be a politician. Andrew McMasters: Yes. This is indeed a political agenda game, without a question. Okay. Jim Hessler: Obama. Kenya. Muslim. Andrew McMasters: Those are my three words. Jim Hessler: Those are my three words. Steve Motenko: All right, give me another three words. Give me a different three words and a question. Andrew McMasters: A different three words and a question? So, an idea would be a different three words. Let’s say, honesty, strength, and integrity. Andrew McMasters: Honesty, strength and integrity. Jim Hessler: That’s too easy. Jim Hessler: Honesty, strength, and Guinness stout. Andrew McMasters: There we go, honesty, strength, and Guinness stout. Andrew McMasters: And your question would be, what do you plan to have for lunch? Steve Motenko: Well, I always drink my lunch, because I’m Irish, so Guinness stout is pretty much all I will have if I’m being honest, because not to be honest takes me out of my own integrity. Andrew McMasters: Right. There we are. Perfect. Steve Motenko: How’d I do? Andrew McMasters: I gave you a softball with lunch. Steve Motenko: All right, you did. Jim Hessler: So this makes us sort of fearless. This exercise helps us realize that no matter how weird the conversation is, we can adapt. Jim Hessler: So, you’ve got a sales challenge here, because the minute you say improv, I think people probably picture themselves up on a stage making a fool of themselves. How do you get people up for that first experience? Andrew McMasters: That’s the biggest issue is that inherent fear. People hear the word improv and it’s two things, it’s the thing we talked about earlier too, of the external focus. Really focusing on your team rather than your individual, and the other thing is just kind of getting over that idea. I will say many times, the number one fear that people list is speaking in public. Jim Hessler: I also think people have watched a lot of, you know, people have been to second city and places like this where the goal of the improv in many cases is to be funny. Jim Hessler: I think, I’m guessing that most of your improv is not about being funny and witty. Andrew McMasters: It’s about thinking on your feet. Andrew McMasters: And about just being honest and being there in the moment and responding to what happens. Jim Hessler: Yeah. So it’s really almost more of a conversation than it is an act. Andrew McMasters: Yeah. There’s a neuroscientist that I work with, give me a little credibility. Jim Hessler: That’s what it is with me and Steve, he’s the Harvard guy. Andrew McMasters: There you go. Jim Hessler: I’m just a schmo. Andrew McMasters: So, Andre Golard is his name, and he talks about the fight-or-flight response from the amygdala. There are twice as many projections from the amygdala that go to the front of your brain, the pre-frontal cortex, as there are that go from the pre-frontal cortex back to the amygdala. Andrew McMasters: Right, it’s going to override your rational thinking. Andrew McMasters: So, really, getting close to that and being able to say, you know what, I’m going to fail, it’s going to be amazing, and it’s going to be a train wreck. Let’s do it! I think that’s where you also find innovation. So, it is telling people that idea in the sales. Yes, it’s going to be outside of your comfort zone, but that’s where you have to go sometimes in order to find the next big thing that you need. Steve Motenko: We just sat in a show recently, if you’re going to be successful, you have to be comfortable with failure. You have to learn to be comfortable with failure, putting yourself out there, taking the risk and learning from whatever happens. Steve Motenko: That’s really kind of what improv is all about. Jim Hessler: Yeah and I think this is a case where maybe the word failure, it would not be a good word to use in this particular circumstance because there really is almost no way to fail in improv. Andrew McMasters: Right. We talk all the time about the radical acceptance of whatever it is. Andrew McMasters: Whatever happened was the right thing that happened. So therefore I say yes to it, and then I build on it. Jim Hessler: I think this is so, I’m just going to do an advertisement for you here. Jim Hessler: You know I’ve done improv. Steve Motenko: Is that okay with you? Andrew McMasters: Yeah, I love it. Thank you. Jim Hessler: I’ve done enough improv, fairly dedicated to it for a year or two that I was doing quite a bit of it and the suspension of ego, I think is what speaks to me most importantly from the management-leadership perspective. The idea that you can enter into a series of exercises with people and it creates a very common ground with you. You’re not the boss in this exercise, it’s very democratic. Andrew McMasters: I had a company a little while ago who wanted me to come in and work with their lower-level managers, mid-level managers, but they said “We don’t need the upper-level, because they’re fine. Jim Hessler: Yeah. We hear the same thing. Andrew McMasters: I said, well, great, I’ll come in and do it, but I’m just telling you, this is a waste of your time, and a waste of your money. Andrew McMasters: Everyone has to have the shared experience. Andrew McMasters: Getting out of their ego. Jim Hessler: I love the concept of listen with your whole body. This is what I heard in my improve classes. I use this in my workshops all the time, and I implore people to listen with their whole body, it’s such a great concept. Steve Motenko: Andrew McMasters from Jet City Improv, Andrew’s website is improvmindset.com, his twitter feed is @improvmindset, it’s been a great pleasure, we’ve got to have you back. Thanks so much for showing up on The Boss Show. Andrew McMasters: Thank you so much for having me here, and thank you for being willing to play. Steve Motenko: After that happened. What I noticed is that you were responding to me much more than you had been previously. Steve Motenko: You were for better or worse, laughing at my humor, more than you had been. Steve Motenko: I felt like the conversations on the show flowed better once you got into this improv training. Jim Hessler: Yeah, and I really did immerse myself in it for a while. It changes things for you, I recommend it highly. Steve Motenko: The Boss Show is produced by Boss Media Productions, our sound engineer is Kevin Dodrill. Jim Hessler: If you missed any of the show, you can get it in its entirety online at thebossshow.com and that’s where you can go for all of our other past episodes and you can also go there to subscribe to the podcast. Steve and Jim: Rule number six.